Centre for Fortean Zoology Australia: What do Kookaburras have in common with possums, or big cats? What do Kookaburras have in common with possums, or big cats? We found out the hard way a few weeks back when a kookaburra collided with our ute in country NSW, smashing into the passenger window along the highway. We'd been looking for big cats after receiving numerous reports from a location, but had only seen cattle, kangaroos - and now a kookaburra! We circled back for the unlucky bird and found him - a forlorn heap of feathers, beak open in shock, eyes unblinking. We didn't hold out much hope for him but picked him up anyway to preserve him from opportunistic predators such as cats and foxes. Halfway home he blinked his eye, and three quarters of the way home he sat up, looked around and seemed (almost) ready to fly the coop. We pulled over to release him but he couldn't go far and flopped around in the grass. Back into the car he went. En route home we touched base with WIRES (Wildlife Information Rescue and Education Service) and left a message on their volunteer hotline. We got a call back just before we pulled into the driveway, giving us the details of a local WIRES volunteer who could help out. Importantly, our helpful caller also told us we were lucky we hadn't released the kookaburra away from its home range. Kookaburras, she told us, didn't like interlopers and a family of kookaburras would have no problem swooping in and killing/dismembering a stranger. Yikes! 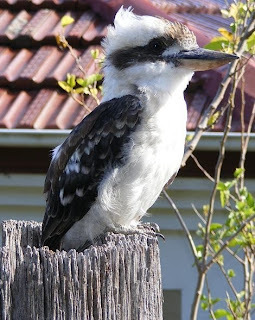 For more excellent information about how to care for crook kookaburras, go here. Possums are similar. many people in Australia try to have possums relocated away from their homes, after evicting them from roof cavities. This rarely works. What happens is the homeless possum often has to fight it out with a resident possum in a new territory, leaving them vulnerable to the attacks of cats and dogs. If you have a possum problem, it's much better to erect a possum box (a new house) on a tree for your problem possum, then everyone can (almost) peacefully co-exist. Before we left we dribbled some water on his beak to make sure he wasn't dehydrated, then we popped him into the box and commenced our 300km drive BACK to where we had first encountered him. We pulled off the highway down a side road and set up the box in the grass, taking off the towel. Then we gently picked him up and perched him on the side of the box so he didn't hurt himself trying to get out. It was all over in the blink of an eye. One minute he was there, the next he'd taken wing into the nearest tree. We heard other kookaburras 'laughing' (a common description for their cackling call, which sounds like raucous laughing) nearby and knew he'd found his family. And yes, we did feel all warm and fuzzy (and mildly guilty for - unintentionally - driving into a startled bird's flight path). Hopefully next time he'll lift his trajectory! Dingo headed the way of the Thylacine? There's yowies in them thar hills!